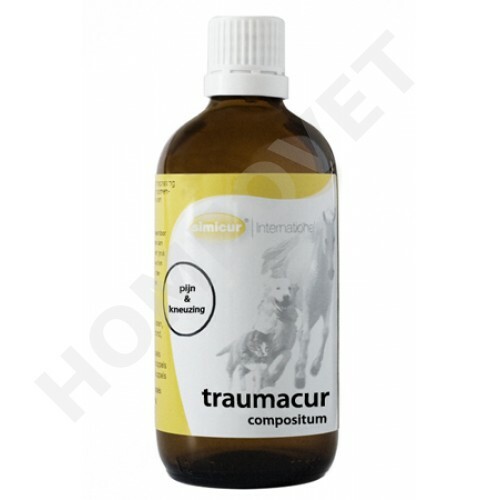 Traumacur is a homeopathic tincture in a 100 ml dropper bottle of SIMICUR for oral use in dogs, cats, horses and ponies. Application: Traumacur has a regulating effect on tissue damage with traumatic consequences such as injuries, bruises and sprains. Traumacur can be applied in the treatment of an injury (cut wound, wire wound and bruise) and post-treatment with a slow healing (after surgery). Due to the analgesic effect Traumacur is also indicated for a sore and stiff neck and other painful joint problems. Effect: Arnica montana has anti-inflammatory, hemostatic, resorbtionssteigernd and restoring tissue. Through the combination with Hypericum perforatum, Traumacur accelerates wound healing and soothes the pain. Traumacur can therefore also be used for treatment in cases of delayed healing (after surgery). Note: administered twice daily for three days prior to surgery Traumacur accelerates healing.